It’s just not warm enough to go outside for too long, so you might as well stay inside and make yourself a nice collection of dried spice mixes. 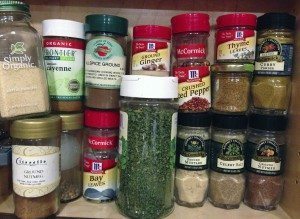 Dried spices are essential ingredients to keep in the pantry; they help round out any dish by giving it more flavor and depth. My favorites are: oregano leaves, rosemary leaves, thyme leaves, ground curry, ground cinnamon, ground cloves, parsley flakes, black peppercorns (to be ground in a pepper mill) and red pepper flakes. I like to concoct interesting spice blend recipes, and when one emerges that’s quite tasty, I create a large batch and give some away. Little spice-blend pouches are the best gifts, since they last about six months, but I have certainly used my spices beyond that date—even years later.